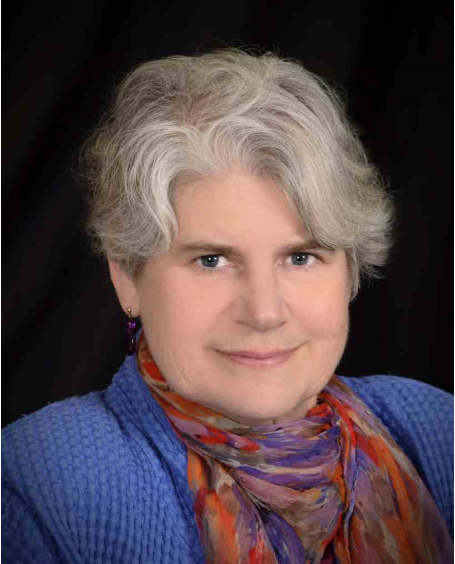 Rabbi Susan Carvutto, surrounded by people of faith, urged compassion at a legislative hearing Feb. 22 in Augusta. An interfaith prayer vigil, attended by about 150 people, followed in the Hall of Flags. I am submitting written testimony today on behalf of the hungry children of Maine, the struggling parent working two jobs who can’t afford healthcare, and the asylum seeker trying to survive until he can apply for a job to support his family. These Maine residents and those like them are in desperate need of your help but aren’t familiar with the intricacies of the legislative process. These are the people I’m advocating for today. 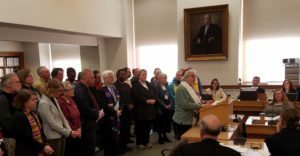 At the Maine Council of Churches, which comprises nine denominations, our faith directs us to be the “Voice for the Voiceless,” to speak for the vulnerable, to love our brothers and sisters as ourselves and to protect them from harm. On their behalf, we urge you to pass a budget that provides them with adequate healthcare, adequate food when they are hungry and adequate help to get them out of the cycle of poverty. Unfortunately, the proposed state budget falls far short of their needs and instead benefits those whose lives are so much easier. On top of the budget cuts we’ve seen in recent years in anti-poverty programs, this budget cuts more than $65 million more. It eliminates General Assistance, which provides food and shelter to 10,000 Mainers annually when they’ve exhausted all other resources. It prohibits the poor from obtaining food stamps after three months even if they live where it’s difficult to find a job or transportation. It cuts TANF benefits even more drastically than they’ve been cut in the past, hurting Maine children who have fallen deeper into poverty at a rate eight times greater than the rest of the nation. It greatly reduces healthcare benefits for the poor by reducing MaineCare coverage. In our faith, Scripture tells us we will be judged by how we treat the least of us. We ask you to pass a compassionate budget, one that improves the lives of those in need, not one that makes their already difficult lives, worse.